The slowing of the car as it pulled over shook me from my drowsy haze, and I looked out through the palm trees and across the rice paddies that stretched out below us. Sluggish but eager, I jumped out leaving sunglasses and hat strewn somewhere on the back seat. My binoculars though, were firmly in hand, and I squinted at our new surroundings, taking in the lily pad capped pools, the shoulder height grasses and the rice paddies fringed with towering palm trees: Kampanti Rice Fields. Instinctively I started scanning the tree tops, the water’s edge and the sky above us. I’d heard quite a lot about this place and pinpointed it on my map before I left the UK. Known as Raptor Bridge, just off the road along the southern side of the River Gambia, this is the place to spot an abundance of the country’s birds of prey. Raptors congregate here to drink from the dikes and pools, which irrigate the rice fields, and take advantage of the abundance of small mammals and insects. Dusky blue portia widow, broad scarlet and violet dropwing dragonflies weaved around us, teasing my patience and photographic abilities. I was being distracted by trying to identify other species that hovered and flitted among us when my bird guide nudged me. There was a lizard buzzard overhead to our right, palm nut vulture above the trees ahead of us, grasshopper buzzard heading right to left. And then we spotted it; a huge raptor gliding high in the distance. A martial eagle is the largest eagle in Africa, and you couldn’t fail to be impressed be its size and magnificence. I was in my element; watching and scanning the skies, taking in the flights of the raptors around us, the murmur of insects in my ears, the movements of waders in the reeds and the lily trotters gently splashing across the water’s surface. I’d noticed another distant raptor flying our way and I turned back to it now. I watched it starting to rise on the thermals, my thought process tripping over itself. Fingered wings and soaring flight – it’s a raptor. Long, bulky bill – it’s a duck. Long legs – it’s a heron… I dared not to speak in case I got it completely wrong but our bird guide must’ve seen the confusion in my face. ‘Hamerkop!’ He said, as if the word would instantly settle my uncertainty. ‘Right, I see.’ I said looking back to the strange, prehistoric bird ahead of us, with its large, angular, crested head. ‘Hamerkop?’ I muttered, watching it gaining height with an elegance and power I’ve never seen any duck muster. With a name like a character from Police Academy, this unusual bird had entranced me. Part wader, part raptor; it’s one mysterious bird. The more I encountered the species, and the more I found out about it, the more mysterious it became. Despite some lumping it in with herons and egrets and others with pelicans and cormorants, the Hamerkop belongs in a family and genus of its own. So named because of the shape of its head, it is resident along some coasts of Africa and Madagascar. It is pretty much always found near wetland habitats, feeding on aquatic invertebrates, fish and frogs, and I was lucky enough to see several more during my travelling around The Gambia. One thing I came to know is that when Hamerkops aren’t confusing biologists as to their classification, they’re building nests. Hamerkops love building nests. And they don’t settle for one pitiful nest that would still easily house them and a number of young. No. They want mansions. At least three of them a season. As our boat leisurely made its way through the mangroves of Bao Balong Wetland Reserve, fiddler crabs waving from the mud banks, I saw the nest before I noticed the bird. I got excited at the thought of what huge raptor had built that nest, about two metres wide, and deep, wedged in the crook of a dead tree overhanging the creek. And then I noticed a small hole low down in the mass of sticks; an entrance to a nest that is not a raptors’ open cup nest, but a huge chamber, hiding away the reproductive secrets of an increasingly enigmatic bird. 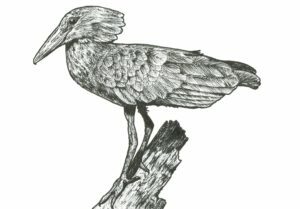 My guide again, smiled and pronounced ‘hamerkop!’ The bird stood below it on an overhanging branch, unperturbed by our presence as if it was superior in the knowledge of its own identity. The hamerkop, to me, holds the intrigue behind bird watching. It’s what drives our interest in the natural world; a world in which we also live but know so little about. I don’t want to make lists of the back ends of birds I’ve glimpsed, or tick names of rare vagrants I’ve clamoured over others to see. I want to try and understand our wild creatures; to step inside their worlds for a moment and get a glimpse in to what, why and how. Wild animals to some of us are our cryptic neighbours, often existing in very different, parallel realms to our own. And no matter how much we try to learn, how much we try to understand, sometimes nature throws up something like the duck-billed platypus, the aye-aye or the hamerkop. Something that doesn’t adhere to our categorisations of wildlife or fit into the boxes we’ve created for the natural world. We will never know everything; the world is too big and too complex a place. Sometimes we just have to embrace what we don’t know, relish the unknown.